As I did with last week’s post about Dromkeen Homestead, I’m deviating a little again this week to write about The Children’s Book Council of Australia and particularly Victorian Branch. It’s a great opportunity to hear about the chosen books, to chat with librarians and the CBCA Victorian Committee and for me, a bit of a personal catch-up time. When I had just completed my Diploma of Professional Writing and Editing at Box Hill TAFE, around 20 years ago, I read in the CBCA Victoria Newsletter an ad for an Office Manager in Vic Branch. Having a background as a Personal Assistant and with a love of children’s books I applied and got the part time job. At the time we lived in Warrandyte and I relished the ‘back to the city’ trip into the Carlton Office one or two days a week where I strolled along busy Lygon Street drinking in the delicious aroma of Italian coffee and Italian food as I visited the post office to collect the mail. From my first office window I watched the pizza chef throw pizza dough high in the air and expertly catch it. My little office was in a shared space with the Australian Booksellers Association, a group of wonderful women who I still catch up with each year. We moved offices twice, further up in Carlton the first shift and then again out to Kew. Part of my role was to receive the Crichton Award entries and it was always intriguing to see these arrive and marvel at the wonderful artwork. I was surrounded by children’s books and children’s book experts and I had the honour of working for Presidents Ann Haddon, the late Graham Davey and Bronwen Bennett. One of the high points of my nine years spent working for the CBCA was the job of sending out the Short List to waiting librarians . . . by fax. I sent the faxes out, one by one, to all the schools who had requested it – sometimes hundreds, and it would take me the whole day. Even typing this now makes me beg the question, why on earth was it done that way? It was at this CBC desk where I first heard about an organisation called SCBWI (perhaps a story for another blog post) and I first came across a publisher called Black Dog Books. At the time I’d been researching and writing a story about an elephant, a zoo icon called Queenie and I decided to send the story to them. I had no way of knowing that Queenie’s story had been told and re-told to publisher, Maryann Ballantyne when she was a child or that publisher Andrew Kelly’s parents had met on the back of Queenie when they were 3 years old. Serendipity. 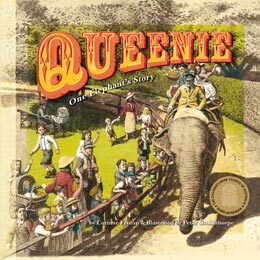 In 2006 Queenie: One Elephant’s Story was published by Black Dog Books, illustrated by Peter Gouldthorpe and the following year was named an Honour Book in the 2017 CBCA Children’s Book of the Year Awards. The CBCA, both Australia-wide and Victorian Branch, is run by a dedicated group of children’s book experts who are committed to recognising and promoting the best Australian Children’s book creators and recommending their books are shared by parents, librarians and teachers with the children of Australia.